.The writer Samah al-Sab’awi and poet Razan Banourah met with two groups of female students from the al-Qubeiba Secondary school for girls from the Jerusalem province, and al-Awdeh secondary school in Bethlehem. The events took place on the third and fifth of March respectively, as part of the programme “Authors in School” implemented by the A.M. Qattan Foundation Library, in cooperation with the Arts Unit of the Ministry of Education and Higher Education, or directly through the schools themselves. 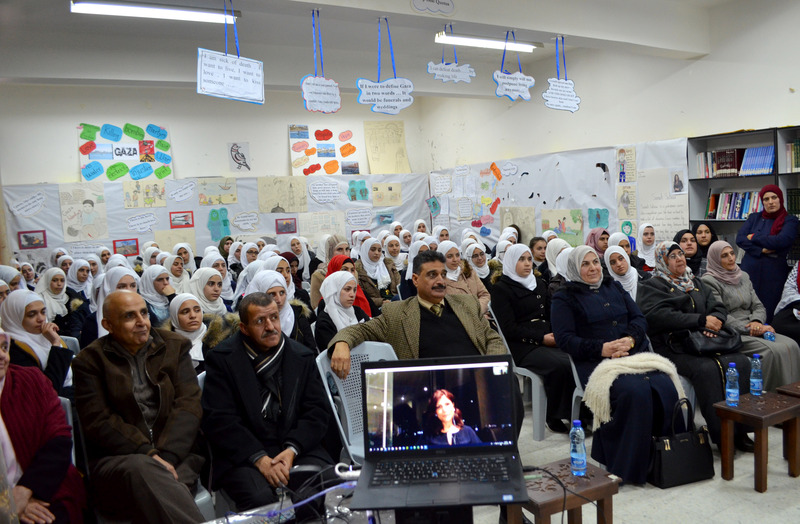 Via videoconference, Australian-Palestinian author al-Sab’awi discussed her play “Tales of a City on the Sea”. Written in English and a recipient of many prizes, the play focuses on events in the Gaza Strip on the eve of the Israeli Assault in 2008, and a story of love embodied in the difficult conditions experienced by Palestinians both inside Gaza and abroad. The students presented a scene from the play, and read some of the poetry included therein. They discussed the details of the play, its characters and events with the writer and then posed her a series of questions, such as: who does she write to? How? And why did she give the play such a tragic end? Sab’awi responded to them saying: The story has not ended, even now. What is left to us is to finish it together, and to make sure that the two protagonists, Rami and Jumana, can overcome the obstacles separating them; the blockade and the occupation. Sab’awi said that she was affected by the profundity of the students thinking, and their critical analysis of the work - that she had even learnt considerably from them. She also thanked the teachers who are care for those students. Sab’awi, who lives in Australia, is a contemporary author, playwright and poet who deals with human rights and social justice. She has many works published including the plays ‘Cries from the Land’ and ‘Three Wishes’, which both focus on the ordeal of the Palestinian people. Maryam Zahran, the teacher responsible for the students who took part, called upon the Ministry of Education and Higher Education to include Sab’awi’s play in the Palestinian curriculum, as it is in Australia. The poet Razan Banourah, accompanied by the writer Ziad Khaddash, Director of the Arts unit in the Ministry for Education and Higher Education, visited Al-Awdeh school, where Khaddash trained students in creative writing skills, and discussed with them his experiences of writing short stories. As for Banorah, she read poems from her collection “Snore”, which received praise and was recommended for publication by the by the judging panel of the Young Writer Award in 2017, organised by the Culture and Arts programme of the A.M. Qattan Foundation. The discussion also reached into the social restrictions placed upon women in our societies, and how creatives can overcome those boundaries through their creative work whatever form it takes. Banourah expressed her happiness in meeting girls who interacted extensively with the her and the poetry with awareness, maturity, and clarity through their questioning which moved her. She also noted the efforts made by al-Awdeh School, which received a prize for their Arabic reading programme in 2017, for motivating their students to read and think creatively as shows in their writing and discussion. Banourah was born in Bethlehem, where she lives and works as a lawyer. She received a Bachelor’s Degree in Law in 2015, and has published many poems and stories in Arabic papers and local magazines, both printed and electronic.